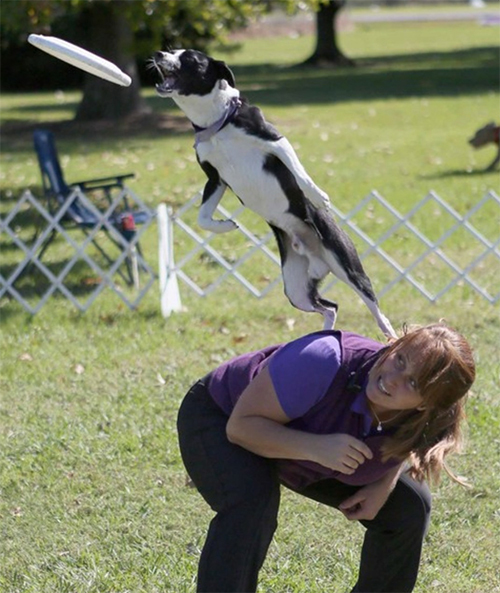 Gail Mirabella started The Dynamo Dogs in 2006 when she and her high flying Frisbee dogs were the featured dog act on “The Greatest Show on Earth,” Ringling Bros. Circus, for four years. She Swears that “Doggie” was her first words, and been training dogs since the age of 10 when she competed in her first kids dog show. She received a B.S. degree in Animal Science in 1991 from Delaware Valley College and started actively competing in K9 disc competitions across the United States and performing her Canine shows since 1997. She’s the founder of a flying disc dog club in the Northeast, the Yankee Flyers Dog and Disc Club. Gail has also been involved in other canine sports, since 1999, she and her canine companions compete in Dock Diving, Flyball and Agility events. 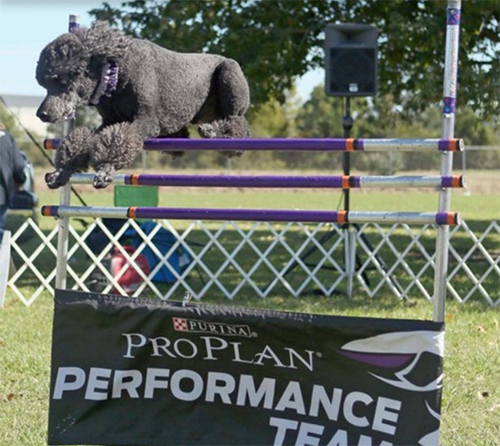 As a dog lover and trainer for more than one canine sport, she travels across the country sharing her expertise and entertaining crowds of all ages. Gail & The Dynamo Dogs’ greatest accomplishment was the 4 year (two tours) of performances for Ringling Brothers & Barnum and Bailey Circus (2/2006-11/2009). They wowed the crowds across the Country and was voted by the fellow performers the "2008 Best Animal Act" award. They also toured with Cirquesa, a theatrical circus (Jan-March 2010) in the state of Florida and was the featured act for a month at the Medora Musical in Medora, ND (June 2010). Many of The Dynamo Dogs have been adopted or rescued. Gail’s entourage includes the unique combination of a father & son duo that performs acrobatic, freestyle routines. The father, Topper the Show Stopper, is one of the world’s smallest Frisbee catching dog. His son, Teaser the Crowd Pleaser, is right on his way to following in his father’s paw prints, his ariel acrobatics amazes everyone! Glamour, an Australian Shepherd, was adopted out of GA, and performs Hoop and rolling barrel tricks while her two Border Collies; K8 and Tag, both adopted from Sweet Border Collie Rescue, are known for their quick and agile disposition that allows them to catch almost every Frisbee thrown. They both are great Dock Diving Dogs too, leaping over 20’ into a pool. The munchkins are made of three tenacious Rat Terriers; Charlotte, rescued out of Florida, displays incredible vertical jumping abilities and hoop tricks while the smallest of her team, Pyper, can walk on barrels and Keeper who is now displaying some comical antics performs his many styles of hoop tricks. Kharma a tiny mini Aussie, was adopted from CT is a main component of walking on the “wheel of steel”! Roxy, a Chihuahua mix, was also adopted out of Florida, rounds out the Munchkins with her hind leg hops through hoops and over jumps. Her pack comes complete with two large dogs, a Standard Poodle, Joker and a Doberman named, Prada. Both astound the audiences with their amazing Frisbee tricks and high jump performances, clearing over 52”! Through their performances, Gail not only entertains but also showcases to the audiences the happy and healthy relationship she has with each and every one of her dogs. Gail supports the belief that with a little time, patience and positive training anyone can create a special bond with their dog. They provided PR for Ringling 1-3 times/wk appearing on many local TV, radio and newspapers across the United States. Gail & The Dynamo Dogs were also a feature story in the July 2007 issue of Ladies Home Journal magazine. Cricket:	2005-Rev Run music video, "Got my mind on the road"
© 2018, The Marshall County Fair, WV All rights reserved.